Marco Rios’s single channel projection At Loulou’s Door is on view every night from dusk to midnight on the Museum’s front facade as part of Street Views, CAM’s outdoor video art series. 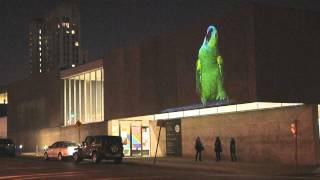 Seemingly perched upon the exterior of the Museum, Loulou—a luminously colored parrot—brightens the cityscape, providing viewers with a sense of the absurd and humorous as they encounter the seventeen-foot-high bird, moving in real time at a monumental scale. With a film noir sensibility and wry humor, Marco Rios uses diverse sources from pop culture, art history, literature, cinema, and the everyday to investigate the presence of kitsch, paranoia, death, delirium, and love within our culture. At Loulou’s Door brings to life the final passages of Gustave Flaubert’s tragic 1877 novella, Un coeur simple, embodying several of Flaubert’s literary and autobiographical references, including the parrot belonging to the novella’s protagonist and the taxidermied parrot the author kept on his desk. Similarly, in At Loulou’s Door, the parrot transcends its corporeal existence and can be understood as a symbolic and omnipresent being. The bird’s tentative gait and fixed spatial boundaries create an underlying tone of uncertainty and a palpable fragility—at odds with its massive scale. Rios’s avian subject becomes a conduit to explore the human condition, replete with its darker physical, visceral, and absurd realities. Marco Rios (b. 1975, Los Angeles) lives and works in Los Angeles. He received his BFA from Otis College of Art and Design and his MFA from the University of California, Irvine. Recent exhibitions include Simon Preston, New York, LA><ART, Los Angeles, and, with Kara Tanaka, Yerba Buena Center for the Arts, San Francisco. He was also included in Let Them Eat LACMA at the Los Angeles County Museum of Art, This is Killing Me at the Massachusetts Museum of Contemporary Art, North Adams, and the 2008 California Biennial at the Orange County Museum of Art, Newport Beach. Marco Rios: At Loulou’s Door is organized for the Contemporary Art Museum St. Louis by Jeffrey Uslip, Chief Curator. Special thanks to Pulitzer Arts Foundation.